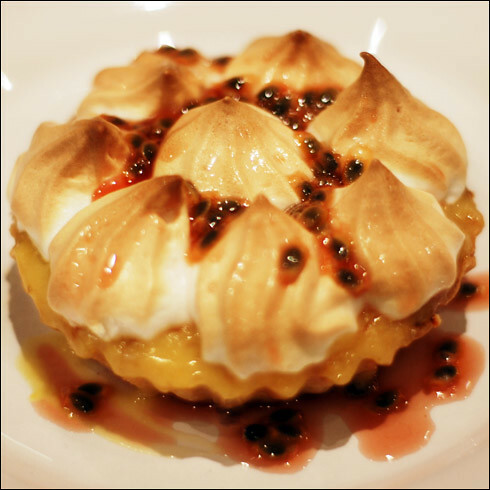 This recipe attempts to recreate the rather excellent passionfruit meringue tartlets served at Ottolenghi in London. They appear to have been withheld from the gastronomic bible that is the Ottolenghi cookbook (perhaps too much of a signature dish? ); but repeated tastings have suggested that the secret ingredients may be the use of mango and orange in the not-just-lemon curd, with the passionfruit being a piece of masterly misdirection at the point of serving. These are a great statement dessert for dinner parties or reminding people that you love them. There's a lot of preparation time required but it's definitely worth it. The recipe's been split up here into four main parts: mango and orange curd should be made the night before; sweet pastry can also be made well in advance; tartlet cases are probably best baked on the day of serving; and the meringue should also be made on the day or at the point of serving. First, grate the zest from the orange, lemon and lime and set aside. Note – you will also want to zest a further lemon when making pastry. Now prepare a fruit juice mix – with the juice and pulp of the mango (sans skin and stone obviously), orange (sans pith), and lemon and lime (also as much as possible sans pith). Blend them in a blender or smoothie maker. This should produce between 250-300ml of juice depending on how juicy your ingredients are. It's probably advisable not to use more than this to avoid making the curd too liquid – you can drink any excess juice at this point. Crack three eggs into a large saucepan and add three further egg yolks (setting aside the whites for use in the meringue later). Cut the butter into small cubes and place about half in the saucepan; then add the fruit zest, the fruit juice, and the sugar. Place over a medium heat and whisk constantly using a hand whisk. Reduce the heat if the curd starts sticking to the bottom of the pan as it cooks. After about five or six minutes – as the curd starts to boil properly with large bubbles coming to the surface – remove from the heat, add the remaining butter and continue whisking vigorously for another minute until it has all blended.Off the heat, pass the curd through a sieve and into a plastic container (ideally with a lid – if not, cover the surface with cling film). Allow it to cool to room temperature, and then place in the fridge overnight. In my experience this is likely to stay good and usable for up to a week – however it is definitely better to use in the next day or two. Sieve the flour into a large mixing bowl, then add the caster sugar, lemon zest, salt and cinnamon. Cut the butter into small cubes and add it to the bowl. Mix together either with hands or using a Kitchenaid until the butter is thoroughly blended with the other ingredients in a coarse breadcrumby consistency. Add the egg yolk (note – the remaining white should be kept with those from the curd preparation, for use later on in the meringue) and water. Mix just until this comes together as a dough, trying not to mix any longer than necessary. If the dough is still too breadcrumby or flaky, add more water by the half-teaspoon to make it just sticky enough to all hold together solidly. This is now ready to shape into tartlet cases. However if you are preparing the pastry in advance of baking the cases, just knead it into a ball, wrap in cling film and place in the fridge until ready to use. It can even be frozen. Tartlets can be made to pretty much any shape or size desired – but ideally use tartlet cases or small muffin tins about 6-8cm in diameter and about 2-3cm deep. Start by brushing the cases with a thin layer of melted butter, then leave to set in the fridge. Meanwhile, prepare a large chopping board or work-surface as a pastry rolling area, and lightly dust with flour. Place the sweet pastry in the middle and roll out thinly and smoothly with a rolling pin, rotating it as you go for evenness and working quickly so the pastry doesn't get warm. Once the pastry is no more than 2-3mm thick, cut out 6 circles to fit the size of tins. The best way to get the size right may be to place an actual tartlet case on top and then cut a larger circle around this using a knife (the circle should typically be about 1.5cm or so beyond the circumference of the case, or more for a deep case). Line the buttered tins by placing the pastry discs inside and gently pressing them into the corners and sides. Ideally leave to rest in the fridge for an hour. Now, to blind-bake the cases. Preheat the oven to 150°C. Line each pastry case with a square of scrunched-up baking parchment (or use paper muffin cases), such that the paper come out 1cm or so above the edge of the pastry. Fill them up with blind-baking beans, then place in the oven for about 30 minutes until golden brown (if they have not changed colour by 30 minutes, remove the beans and lining paper and continue baking for 5 minutes longer). Remove from the oven, setting aside the baking beans for future use; after 5 minutes remove the tart cases from the tins; then leave them on the side to cool down completely. Spoon the lemon curd (cold from the fridge) into the tart cases so they are about three-quarters full, with at least half a centimetre of pastry remaining up to the rim of the case. Place temporarily in the fridge (unless you are planning to serve warm shortly). For making the meringue, Ottolenghi's trick of pre-heating the sugar always seems to work very well. Preheat oven to 200°C, spread the sugar over an oven tray lined with baking parchment, and place in the oven for 5-6 minutes. Keep a close eye on it so as to pull it out before the sugar begins to melt or caramelise. On removing from the oven, reduce the temperature to 150°C. Immediately on removing the sugar from the oven, place the egg whites in the bowl of a Kitchenaid (or a large mixing bowl if using an electric hand whisk). Whisk on high speed until the whites begin to froth. Bring the speed down a little and carefully pour the hot sugar off the baking parchment and into the meringue mix as it whisks. Once all in, raise the speed again and continue whisking until the meringue is firm and shiny – this should require at least 10 minutes whisking in an electric mixer, and more like 15 or 20 if you have the misfortune to be doing it with a hand mixer (which I did once for this recipe – never again). Now remove the tarts from the fridge and dispense the meringues on top of the curd. It's strongly recommended that you use a piping bag to pipe the meringue mix out as you can create fantastic artistic patterns (or just pretend that you have finally been given the keys to the Mr. Whippy van you dreamed of owning as a child); however you can just spoon it out and shape further with the spoon. Place the tartlets in the oven, at 150°C, for about 3 minutes to brown the top very slightly. If planning to serve warm immediately, you may wish to leave in for an extra minute or two, but no more than that should be necessary. If planning to serve cold, you may wish to brown the meringues very lightly with a blowtorch rather than place in the oven. Finally, scoop the juice and seeds from the passionfruit, mix in a small serving ramekin with the Chambord raspberry liqueur, then drizzle the mixture over the tops of the meringue tartlets. Either serve at once, or chill for up to 12 hours. Superb, I will be trying this!